Missouri City janitorial service is our specialty. We provide janitorial & commercial cleaning services in Missouri City, Houston, Sugar Land, Stafford, & Pearland. Our #1 goal is to make sure that your facilities remain clean & tidy. Our qualified staff has 20 + years of experience cleaning all types of buildings in & around Houston TX. Call A&T Janitorial today (713)653-3784. We will clean everything from your boardroom to your bathrooms working around your schedule! We understand that janitorial work is a tremendous commitment. Most importantly, it means making sure that your building is cleaned thoroughly on a regular basis. A & T Janitorial Services is committed to keeping your property spotless. We recognize that our clients have diverse cleaning needs. Fortunately, our staff members have 20+ years of experience and are fully trained, insured, & bonded. Professionalism is our number one priority. Consequently, we will be there for our clients regardless of what they need from us. All too often, businesses run into conflicts with cleaning services when it comes to scheduling. Therefore, A & T Janitorial Services is able to keep flexible hours for our clients, regardless of the nature of the job. We understand that different people are going to need cleaning at different times. Your business shouldn’t have to work around us. We’ll make sure that we provide our services in a timely, effective manner that won’t force you to make any sacrifices in terms of your time. In addition to our Missouri City janitorial service, we offer professional floor & carpet cleaning. Carpet and floors don’t stay in good condition forever no matter how frequently they are cleaned. Fortunately, with our floor maintenance and stripping service, we can make the floors of your business and residential building look new again. A & T Janitorial Services can provide quality service on a day-to-day basis and a year-to-year level. We’re committed to completing each and every job that we receive. Every project is a priority for us. When customers work with A & T Janitorial Services, they know they are getting high quality service & professional commitment. Many businesses use carpeting in their office space. Unfortunately, replacing it is very expensive and time-consuming. Far too many carpets start fading well before their time because they were not properly cared for. Most of all, that’s a situation that we can help you prevent. When carpeting is kept clean and tidy, it can look fantastic. However, carpets are excellent habitats for all types of parasites. More than any other surface, they manage to trap dust, dirt, and moisture. Our Missouri City janitorial service takes this into account. We understand that this is something all carpet owners have to deal with. As a result, we have the supplies to make carpets look continually fresh and new. Our service uses many of the most modern carpet cleaning techniques. We will preserve the original texture and color of the carpet while keeping it clean. Floor stripping & refinishing is a difficult job that involves potent chemicals and attention to detail. Most noteworthy, we have several Missouri City janitorial service staff members that have been refinishing floors for over 20 years. You will receive their valuable and specialized skills. When your floor is in the hands of our capable staff members, it will be restored to its original appearance in no time. Floors that have the proper finishing look polished and effortlessly cleaned. Finishing chemicals have a way of protecting and preserving the floor for an extended period of time. An investment in floor refinishing will protect and provide a stylish floor that a business or homeowner will enjoy for a long time. We understand that customer service is everything. A&T Janitorial Services is deeply committed to excellent customer service. Because your clients deserve the best, we are proud to provide the best with our Porter Service. We can help your business uphold your high professional standards by providing experienced porters. Our porters have worked with a wide range of businesses and with several customers. They are available for hire temporary or serve as staff members in their own right, either way you will get a highly qualified team member. At A&T Janitorial Services, we believe that building maintenance is essential to keeping a building clean and presentable. Many janitorial services are interested in scratching the surface, but we care about the foundation. Unfortunately, a building that isn’t properly maintained will depreciate faster. A&T Janitorial Services can offer a building maintenance that will keep your facility standing strong for a long time. Some business buildings and residences need carpet and tile maintenance. Therefore, we are proud to offer our clients both services. 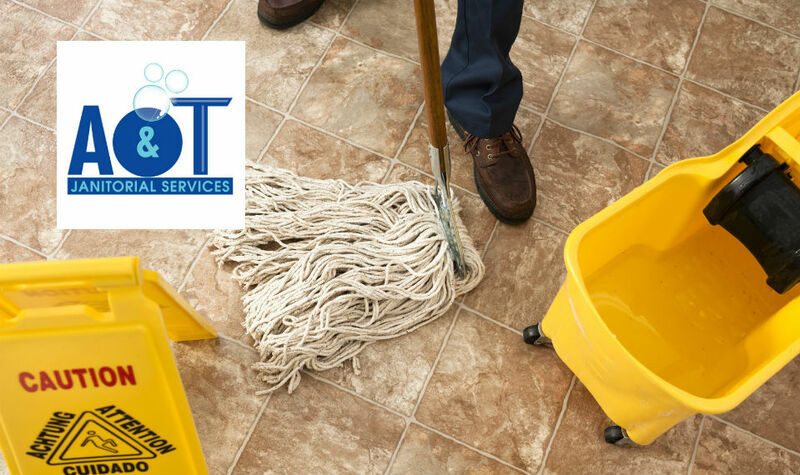 Tiles and carpets require very special types of maintenance and care, and our Houston janitorial services staff has the wherewithal to handle both types of flooring, as well as hardwood floors. Caring for tiles improperly can make them looked scratched and caring for carpets improperly can damage them permanently, leaving blotches and uneven textures. People that have buildings fitted with carpeting and tiles will be faced with both problems when they’re in the wrong hands. A and T Janitorial Services won’t let these problems happen. We have the proper equipment and trained staff to ensure your tiles and carpets continue to look new. Many construction sites employ people to keep the construction sites clean during their operations. However, when it’s time to clear away all of the construction equipment, the question of who cleans the site is sometimes unresolved. The people that are hired to maintain construction sites aren’t always hired to clean them afterwards. Also, they may not have the expertise to clean every aspect of the sites. Construction is messy work, and that’s where we come in. We can get your construction site in order after you’re finished and prepared to move on with your work. In addition, our Missouri City janitorial service staff is equipped to handle hazardous materials and can work with a wide range of different construction sites. Therefore, we can make sure that your company will be able to get everything wrapped up quickly and effectively.